Digital currencies were one of the most profitable investments of 2017. With the digital currency floodgates open, early investors have become accustomed to four-digit returns. But there’s a catch. Many of the currencies listed above have already achieved mainstream investors. They will continue generating profits (which makes them valid investments), but you'll never be able to buy them for under $1. 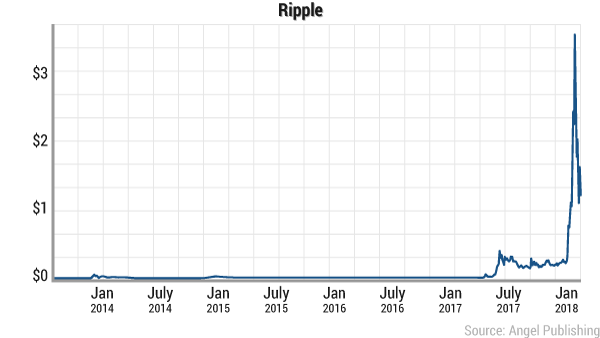 For investors looking for a smart investment under $1, Ripple could be a good contender. Ripple isn't your traditional digital currency. Calling it one is the equivalent of calling a horse a mule — you vastly undersell the currency’s potential. Today, Ripple is busy revolutionizing the ways in which we transfer money and receive payments. Soon, it will change the ways in which we bank and conduct business around the globe. For starters, it's important to be able to differentiate between Ripple Labs — the company that produces the Ripple Transaction Protocol (RTXP) — and XRP — the digital currency that operates within the RTXP. The Ripple Transaction Protocol, in the simplest sense, is a real-time payment system. It allows money to be exchanged between individuals regardless of their locations or banks. The digital asset that runs the Ripple network is XRP. When you buy Ripple, you're also purchasing XRP. If you're new to digital currency investing, the best way to think of XRP is as a currency (or fuel) that powers Ripple. And while preferable, XRP is not necessary in order for the RTXP to function. Ripple was developed by an experienced team with deep roots in the digital currency world. Many members of this development team worked with Bitcoin. This includes Ripple’s cofounders, OpenCoin CEO Chris Larsen and CTO Jed McCaleb. Investors who are considering Ripple need to understand the relationship between OpenCoin and currency. OpenCoin handles many of our digital currency transactions around the world. OpenCoin, and subsequently Ripple, has received backing from dozens of venture capitalists, which includes Andreessen Horowitz, FF Angel IV, Lightspeed Venture Partners, Vast Ventures, and Bitcoin Opportunity Fund. But how does Ripple function? How exactly is it unique in the digital currency world? Everyone is in agreement that our current financial system is flawed. Transferring money to individuals outside of your bank is a grueling process. And you might as well forget about exchanging money overseas unless you love having a headache. And that's where Ripple comes in. XRP can be used in the Ripple Transaction Protocol, which can be used to ferry not just digital currency but also money and information. The idea is actually thousands of years old, dating back to medieval Arabia. Years ago, individuals would exchange money through an agent. You, as an individual, would walk up to your agent and give them money with instructions to send it to your friend. This agent would then send it to the agent of your friend. Even though money didn’t exchange hands on either end, a record of the money being moved was put into place. The receiving person’s agent would be responsible for moving the money along to the intended recipient. Ripple simplifies that process, issuing a monetary payment through a digital channel. Similar to the medieval method, the money never actually changes hands. Both people have access to a secure channel, which boxes out any potential threat. This makes Ripple an incredibly effective, secure monetary exchange that empowers individuals. And Ripple’s developers have more in mind for Ripple’s exchange potential than just money. Ripple could be used to exchange anything — simply through the creation of a secure pathway. This unique function makes it a powerhouse in the digital currency world. And even though this method directly empowers the individual, it's also a profit generator for large corporations. It would be foolish to think that our banking systems will disappear overnight. This belief is popular in the Bitcoin crowd, with many devoted Bitcoin believers asserting that the world’s first digital currency has the power to rebuild our financial system within mere years. The reality is different. There's no doubt that digital currency is here to stay. But we're more likely to see it incorporated into our everyday financial lives through the large players in the financial world: big banks. So, why do the banks want Ripple? It goes back to the financial tools that Ripple Labs, the company behind RTXP, provides. Let’s be honest: Major financial institutions don't adopt a technology for the ease of their customers. Instead, they do it to make money — that's the nature of the beast. Currently, if a bank uses Ripple, it saves $3.76 per payment. That's a cumulative saving of $564,000 a year. But the greed of financial institutions pays off for customers who'll be able to exchange money across borders and with individuals who use different banks. We'll likely see the value of the Ripple company (or the value of XRP) increasing while more of these tools are adopted by mainstream banking customers. This will simplify our financial system. You'll be able to send money to anyone, regardless of what bank they have, through the same simple channels. We touched briefly on Ripple’s talented development team in the introduction. Now, it's time to expand on what that extensive talent network means for the digital currency in the long term. It’s no secret that success in the corporate world depends on one thing: clout. For any technology to advance, it has to establish its value for both investors and corporations. Many digital currencies fail to do this because their leaderships don't know the right people or methods. For Ripple, becoming established was as easy as pie. With two well-connected founders who used their complex networks, Ripple quickly attracted venture capital and major investors. In 2015, Ripple raked in $55 million in venture capital in just one funding round. And this money is continuing to pour in with more big investors backing the company weekly. One particular investor is worth taking note of. It's a tech giant that hasn’t shown a lot of interest in the bulk of digital currencies: Google. Google was one of Ripple’s early backers. Both the mega-giant and its peer Apple prefer the blockchain method of payment to existing credit cards. In Ripple, Google saw an opportunity to simplify and secure payments. It knows a good investment when it sees one. It’s obvious that Ripple Labs, and its financial tools, is valuable. It increases efficiency and saves time and money for both consumers and banks. That being said, Ripple is an anomaly in the digital currency world. Very few people realize that not all of the banks using the RTXP are using the associated digital currency XRP. Beyond that, there's also the quandary presented by Ripple’s low price. The low price doesn't necessarily mean that there's room for the currency to grow. In January 2017, the digital currency reached an all-time high of above $3, giving it a market cap that was nearly half the market cap of Bitcoin. Of course, in the cryptocurrency world, arguing about market caps is largely subjective. After all, how do you value a potential global currency like Bitcoin or a vastly valuable tool like Ethereum? So, Ripple’s market cap at the time of its $3 price was outlandish compared to that of other companies providing financial tools. I'm going to level with you: Ripple is a bit harder to invest in than its peers. But because you're serious about making money, this is a good thing. Ripple’s exclusivity means that not everyone is in on it yet. At Wealth Daily, we use Coinbase for the bulk of our digital currency investments. Coinbase allows users to buy litecoins, bitcoins, and ether with the hopes of expanding to other digital currencies in the future. And Ripple could be on the horizon. But we don’t want you to have to wait until then. So, we'll walk you through buying Ripple on smaller exchanges. That way, you can get the currency while it's under $1. Before we part, we'd like to extend a sincere thank-you for joining us here at Wealth Daily. We look forward to providing you with valuable investment research and commentary over the course of your subscription. Our core philosophy is that the more you know, the better you'll be able to take advantage of that knowledge to expand your wealth. We'll continue sharing our insights on how to boost your portfolio with flexible and safe investments.